Color pencil and crayon on ten found text pages and one map from “História dos Feitos Recentemente Praticados Durante 8 Anos no Brasil” by Gaspar Barleu, publ. Sao Paulo, 1940. Pages From A Bahia Diary on view, September 30, 2017–October 29, 2017, at Gallery 38. “Pages From A Bahia Diary” is a month-long exhibition of Los Angeles based artist J. Michael Walker’s portrayal and exploration of the Afro-Brazilian people and spiritual culture of Bahia, based on his Sacatar Foundation Fellowship in 2011, an experience so profound that documenting and interpreting it has occupied much of the past six years. 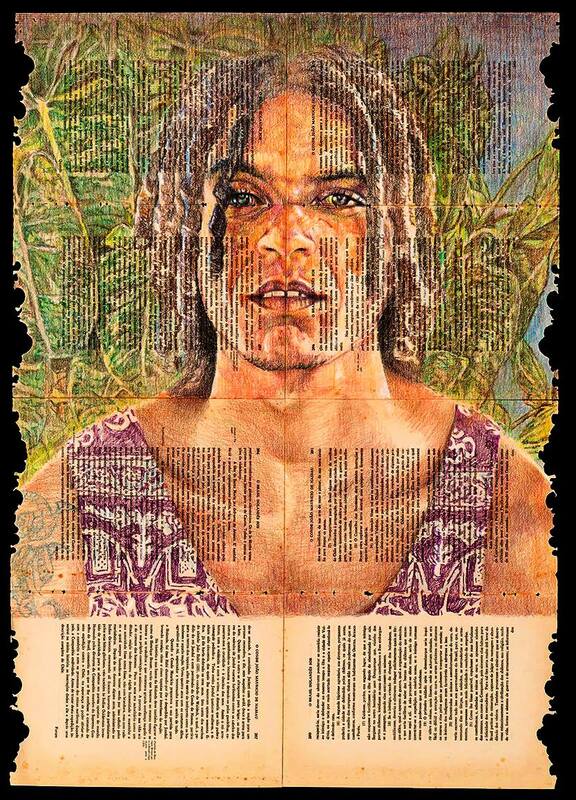 The title of the show refers not only to the artist’s record of his experiences, but also to the antiquarian text on which he draws – a 17th century documentation of the Dutch Colonial Empire of Brazil – which, in turn, becomes the theater in which the Afro-Brazilian women Walker befriended emerge from and dominate that history of colonization and enslavement. Curated by Badir McCleary.